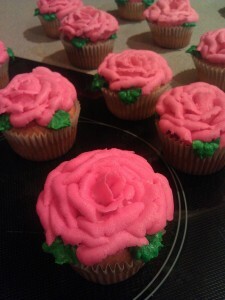 The rose cupcakes actually weren’t what I originally had in mind. I’m somewhat annoyed so just look @ the pictures while I quietly sulk about it. 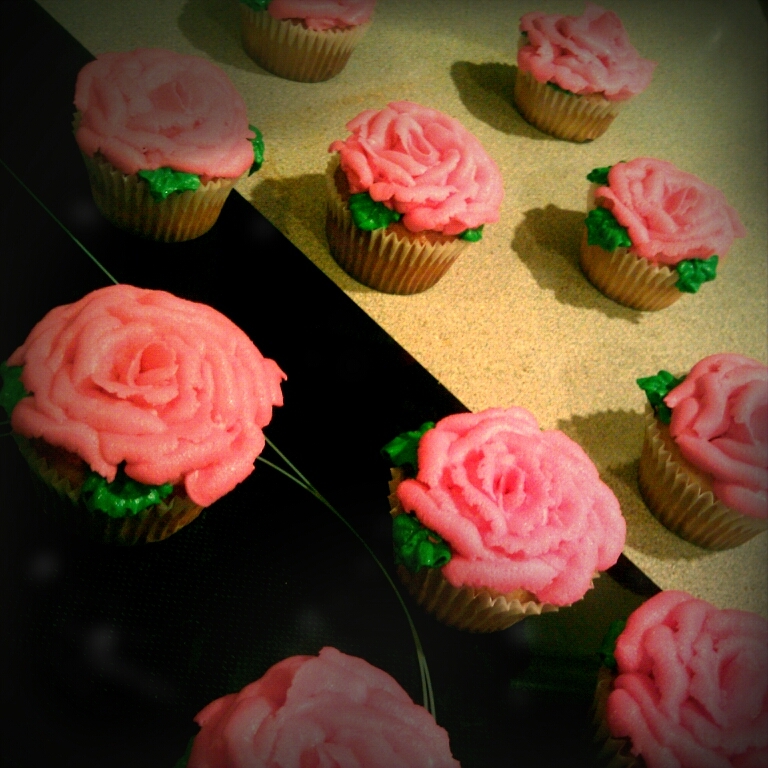 All I’m gonna say is if the day ever comes that I can no longer make buttercream roses in my sleep, that’ll be the end of the world. 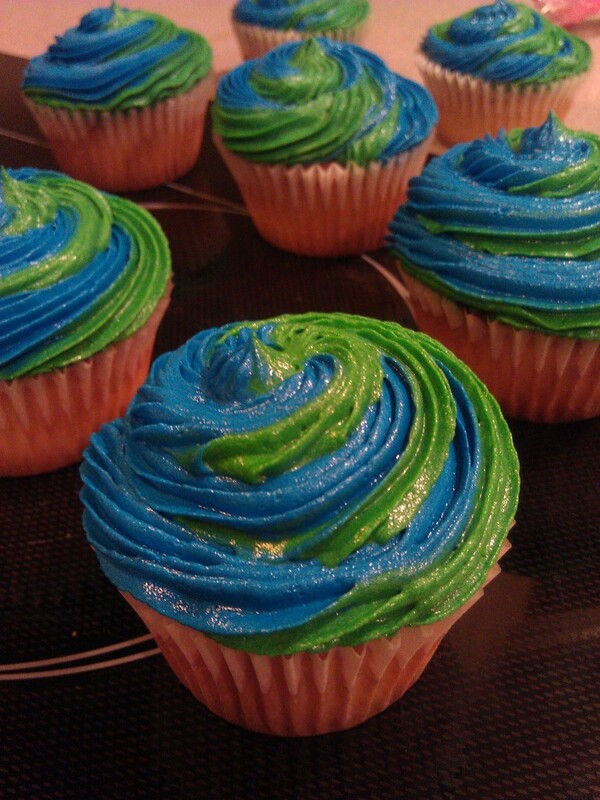 Note to self: requests for blue + green swirl frosting = cupcakes that look like “Earth”. The abstract art idea popped into my head after browsing the ThinkGeek catalog (I love the stuff from that store!) and seeing a tee shirt that was a play on Hello Kitty. 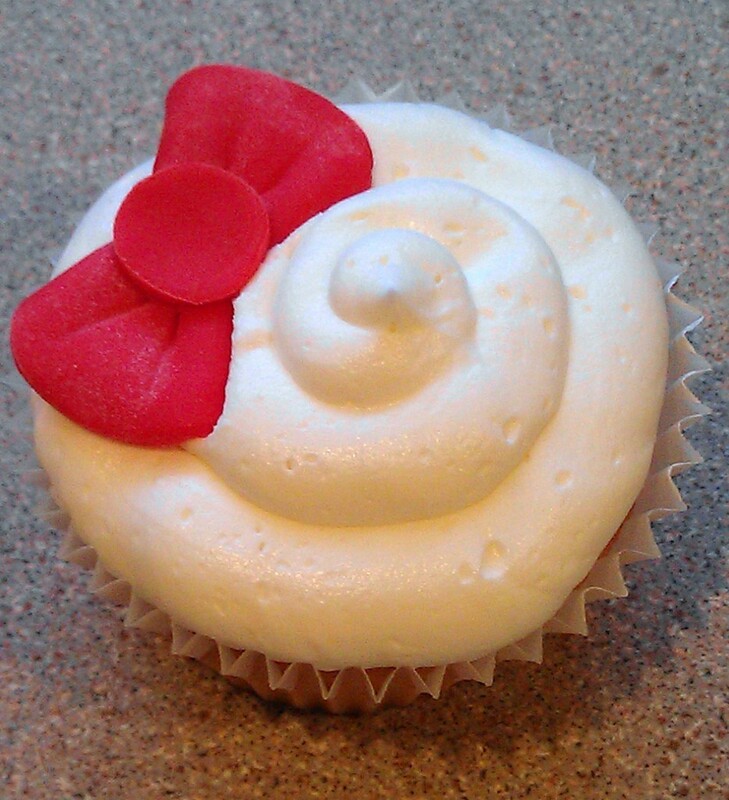 It was just a white cube with the trademark bow with the headline “Hello Schröddy” and that was perfect for a cost-effective cupcake design. I got a kick out of the physics joke about Schrödinger’s cat, too (yes, I wholeheartedly embrace my nerdiness). A crackly and "eh"-looking experimental first bow... which is why it's called a "test bow"
I made a super light vanilla cake batter and whipped up some white vanilla frosting for basic swirl designs. That part was easy. 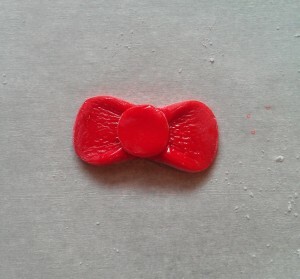 Making the bows turned out to be a bigger undertaking than I expected, even when I used *gasp* ready-made fondant. Yeah, I know… I said I’d never use it again, but I was in a pinch. And in hindsight, MAYBE I should have just made my own. The bright red fondant-from-a-tub was the perfect color, but it dried up soooo quickly. After rolling out the fondant, I was barely able to cut out shapes for three bows @ max without the fondant starting to crack. WTF? I had to toss a chunk of it out b/c the fondant was rock hard and useless, so I just rolled out a small ball of it and cut a few shapes @ a time. I don’t have bow-shaped cutters and had to improvise so I used circle cutters that were two different sizes: a tiny one for the middle of the bow and the sides are actually pinched-in larger circles. After making about ten of these, I realized I left out a little nub on each side of the bow but decided eh, I was over it. They look pretty close though, right? 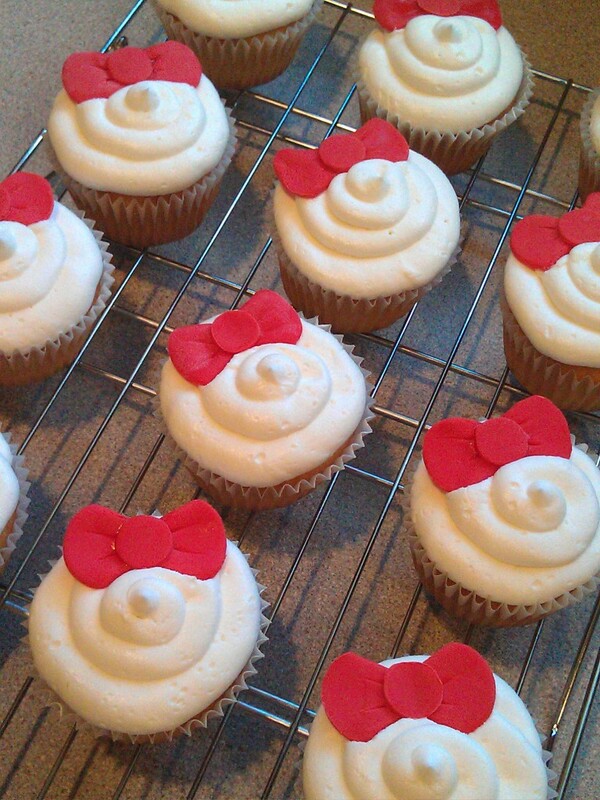 The fondant dried within minutes, so I immediately placed each bow on the corner of each cupcake. Labor Day weekend signifies the last weekend of summer, and most normal people spend it chilling out, maxing, relaxing all cool being all lazy, but we were the anti-thesis of beach bum, BBQ-ing, beer guzzling couch potatoes. We had just signed the papers to sell our house on Thursday, and we had people coming to view the house Friday. I was let out of work a few hours early on Friday for the holiday and had originally planned on baking cupcakes and making frosting for Vin’s little niece’s 2nd birthday party, but I rushed home to re-organize some clutter @ home before the potential buyers came. (Cross your fingers! They really liked the house!) I was too pooped to even think about baking by the end of the night, so I woke up early on Saturday to do everything before the party @ 2. The theme for Penny’s birthday was pink pigs in honor of the petting zoo animals that were coming to her party. I knew I wouldn’t have time to plan for and decorate an entire pig cake, so I promised cupcakes instead. 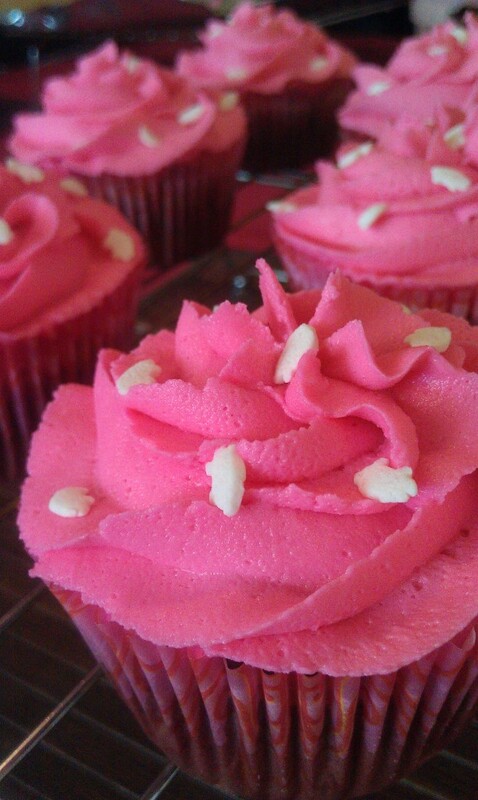 The birthday girl had asked for chocolate and hot pink, so chocolate cake and hot pink frosting she got. Vin’s sister had requested about two dozen cupcakes, and the batch of cake batter I made was enough for 37 (perfect for exactly 3 dozen cupcakes for the party and 1 test one to cut up into tiny bites to analyze and eat). I decided to turn the extras into “adult” cupcakes… not anything with genitalia shapes (if I did, I wouldn’t be posting pics! 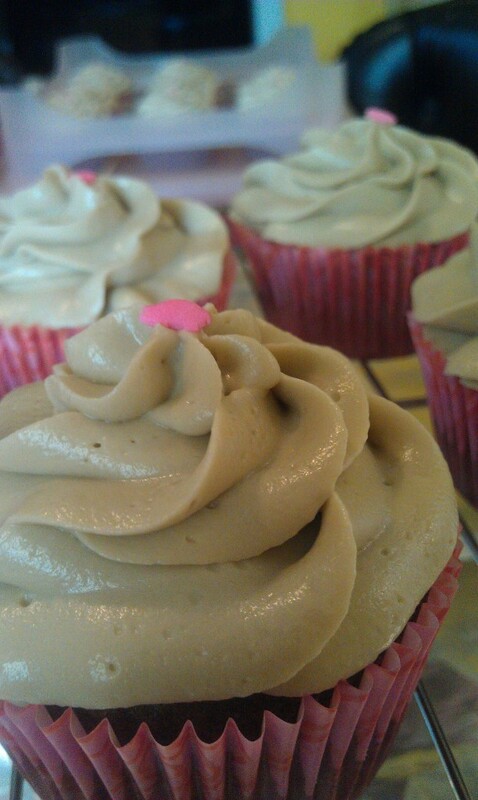 ), but added some booze and caffeine =) I was like, “hmmm….” and whipped up some Kahlua-coffee-mocha frosting for the extra dozen; the icing was a little melty b/c of the liquor, but it tasted really good! AND, to top it off, I just so happened to have pig-shaped candy sprinkles for the cupcakes. 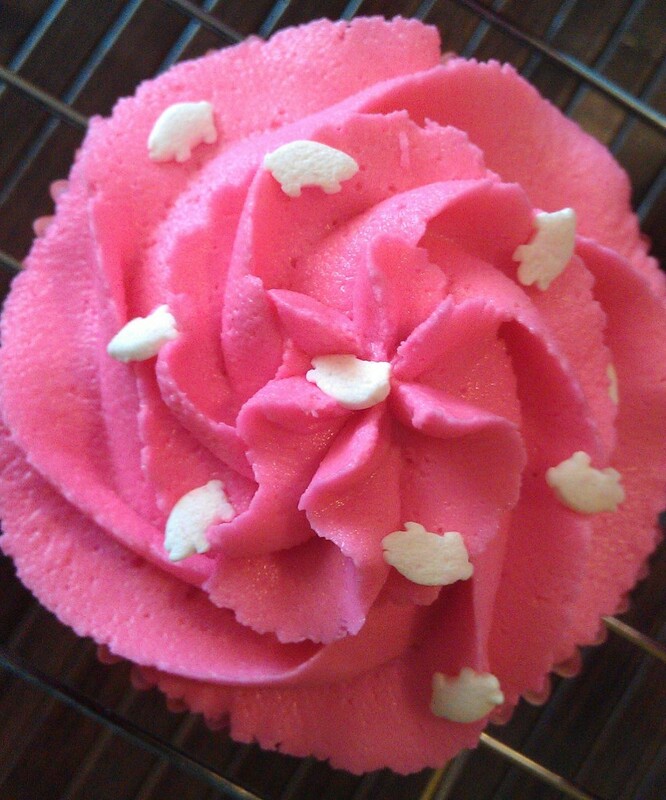 Tiny white pigs were carefully placed on the hot pink frosting and one little pink pig was put on the grown-up cupcakes. The only thing that affected us was that the LIRR was suspended on Monday. Man, what a pity =P Vin and I worked from home and I was excited to use the extra time NOT COMMUTING to bake. That didn’t happen. A realtor was coming to check out our house the next day and I rushed to tidy up the place to appear semi-presentable. I left work early to make sure I got home in time for the appointment with the real estate agent. The train ride was surprisingly on time, so I had a couple hours to spare and decided to start making the dough for cream puffs, or pâte à choux en français. I triple-checked to make sure I didn’t leave anything off the super simple ingredient list and cut the measurements in half (uhh, I have no reason to be making 80 puffs). 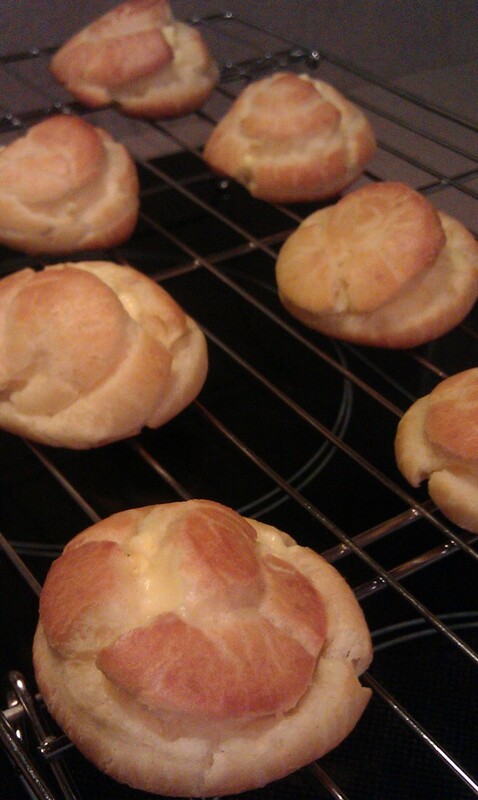 The realtor came in as I was placing the choux on the cooling rack and the house conveniently smelled awesome. Seriously dude, I need to bottle that sh*t in a spray and have this odor wafting through the house whenever potential buyers come so maybe we won’t have our house stay on the market for long… I’d offer a year’s supply of baked goods to whoever buys our house but unfortunately I don’t think that’ll seal the deal. haha I whipped up a basic filling that tasted like a mix between whipped cream and Boston creme pie filling and squirted it in the puffs until they overflowed. Vin tried one of the unfilled f*ck-ups. He said it was still light, airy and fluffy. 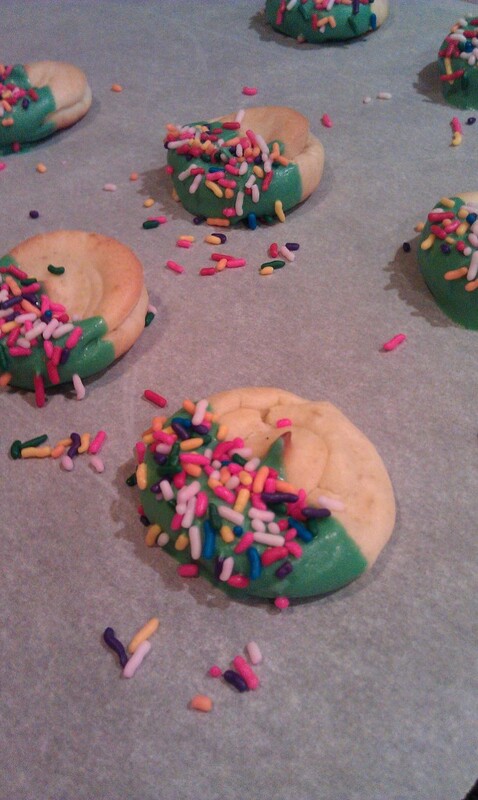 I couldn’t fill the flatter choux so I just dipped them in chocolate and dropped rainbow sprinkles on them. Haphazard? Yes! Gross tasting? No!